Prepare your learners for the Progression tests and Primary Checkpoint test with a new course offering full coverage of the Cambridge Primary English curriculum frameworks for Stages 1-6. 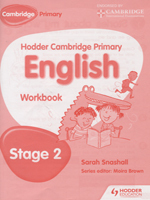 We are working with Cambridge International Examinations to gain endorsement for this Workbook, which has been designed for either homework or extension activities after the relevant pages in the Student Book are completed. - Build on what has taken place in the lesson - Challenges students to develop their learning further - Ideal for homework or extension activities.